All Uninterruptible Power Supply (UPS) systems look much of a muchness. They are black boxes of varying sizes, which all claim to deliver unfailing power protection. UPS purchases are not made based on their aesthetics, it is their performance that gives them their point of difference. Successfully achieving differentiating factors and ultimately superior UPS performance relies heavily on not just forward thinking research and development but also quality fabrication. One of the longest standing European UPS manufacturers is Borri Spa. As the company approaches its 87th year of manufacturing, the company’s CCO, Bessam Moutragi takes a look back at its rich engineering history. “We have seen the global manufacturing journey go full circle. The turn of the millennium saw a lot of European businesses along with a number of our counterparts move their manufacturing to lower cost parts of the world including China, Taiwan and Turkey. Whilst this has been a successful short term plan towards achieving a better bottom line, it is not something that Borri has ever considered. “Borri Spa is one of the few remaining, genuine UPS manufacturers in Europe. Whilst many other businesses have moved their manufacturing to more commercially advantageous locations around the world, in order to maintain high quality standards, we have remained steadfast in our core manufacturing principles. “Over the years Borri Spa has invested heavily its production facilities, which now span over 20,000m(2). All of our UPS components are designed, developed and engineered in Europe and quality tested in our own manufacturing site in Bibbenia. It is this pedigree that positions Borri UPS in a different class. Not only are we leaders in the field for developing standard issue standalone UPS solutions ranging from 10kVA – 6.4MVA, we are also renowned worldwide for delivering custom built power protection solutions. “Working in close partnership with our international network of distributing partners, Borri operates across five continents and is able to support its entire customer base onsite. 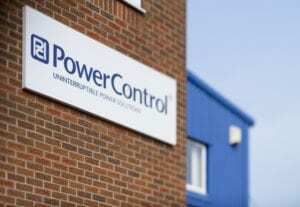 One of our closest allies is Power Control Ltd in the UK. We partnered with them in 2009 and were drawn to the company’s unique business offering. Power Control has been operating in the power protection market for over 23 years and has a very tailored approach to working with its clients. These synergies make this partnership a strong force when it comes to offering bespoke UPS solutions. “Showcasing this, we completed a very specialist project for one of the UK’s largest water treatment works. We worked in close conjunction with our core UPS solutions partner, Power Control Ltd, to supply, install and commission 18 custom built 100KW IP54 UPS units. Positioned as standalone units, the UPS systems are now providing essential emergency backup power across the entire water treatment site. “Power Control demonstrated its extensive knowledge of the complex requirements demanded from the multifaceted utilities sector and was expertly placed to provide a future proof power protection strategy and essential technical guidance towards the development of the UPS systems. One of the key prerequisites was for the solution to be IP54 rated (protected from water and dust particles), with a sizeably reduced footprint. “Rather than issuing a standard IT grade UPS within an IP54 rated box, Borri was able to design and manufacture an IP54 UPS. The customised solution also needed to be reconfigured to be smaller than the standard Borri 100kW units as space was extremely restricted. The modified units now boast a significantly reduced a footprint and are all front access for easy access and maintenance. The air inlet and outlet fans are also on the front meaning the UPS systems can be pushed right up against a wall, which also contributes to space saving. Power Control’s sales director, Justin Tarrant-Willis commented on the project: “The water treatment works had incredibly strict specifications from the offset. Power Control won the work based on its ability to deliver custom built Borri UPS solutions and its commitment to delivering the installation within a tight timeframe and within stringent budgets. “Having worked in partnership with Borri Italy for almost a decade on developing bespoke power protection solutions, Power Control was confident that it would be able to provide customised UPS systems that could be IP54 rated and significantly reduced in size. With the Borri UPS units fully operational, Power Control has been working closely with the client to review its long term operational efficiency. Commenting on this, Power Control’s special applications director, Matt de Frece said: “Industrial applications are inherently inefficient. However, in order to improve efficiencies adopting a simple solution of placing UPS in ECO mode can save £thousands. “Analysis from Borri shows that heat dissipation, at full load in online mode is 6.6kW, whereas in ECO mode heat dissipation only reaches 1.5kW at full load. Based on this, it would be fair to say that the client could save up to £80k a year, equating to approximately £4.5k per UPS. The ECO mode was therefore a very viable option and a huge leap towards lowering TCO. Mr Moutragi concluded: “In the last decade we have achieved incredible successes with more efficient, more resilient and more flexible technologies. However, the market place is now flooded with solutions that not only meet the operational demands of business’ today but also address the aggressive environmental agenda. It has therefore been critical for Borri to not only maintain its industry leading quality levels for standard issues UPS systems but also develop its skills, knowledge and engineering proficiencies to deliver custom solutions for the ever evolving applications they are required for. Working with Power Control gives us a valuable edge when it comes to understanding the needs of the UK market.